Woks are widely used in Asian cuisine, but are now to be found everywhere! And the good news is that they can be used for more than stir-fries and noodles: woks can be used to make all types of dishes, not just Asian ones. Here's our guide to versatile wok cuisine. A wok is a type of hemispherical pan. Its bottom is small in diameter and its sides are tall and wide. Some have a flat base, others rounded, because they’re designed either for wood fires or gas cookers. The diameter varies from one wok to another. For a 30cm wok, the 30cm refers to the diameter of the widest part, not the bottom part. The advantage of wok cooking is that it cooks your food quickly with little oil or no fat, because the wide sides keep the heat in, while the small bottom means there’s only a small area in contact with the source of heat. All foods can be sautéed in a wok; you just need to stir them with a wooden spoon or shake the wok regularly. It's great for quick-cooking vegetables, because they stay crunchy and retain the maximum of vitamins. If your wok has a grill, you can also steam or reheat food over a large surface area. Some woks come with lids, so you can braise and stew food in them. Woks are suitable for frying, as the edges stop food from spattering everywhere like they do in a frying pan. Ideally, use a half-moon grill with it to allow the fried food to drain. Woks that are too small or too low at the sides aren’t that good because you can’t toss vegetables properly in them, and everything gets heaped up at the bottom. The bigger it is, the more ingredients you can use, but the more difficult it is to manage! So don’t go for one that’s too big: opt for an average-size wok (28-30cm). Think about the room you have in your cupboards too, unless you’re going to hang it from the wall (some woks are designed to hang). It depends on how much space you have, but an electric wok has few advantages because it needs to be left on its support, which takes up room. A manual wok is easier to use and can be used as a serving dish too. >> Cast-iron, steel or aluminium? Cast-iron and steel woks are heavy and thick, to ensure better cooking and stop food sticking to the bottom (provided they have a non-stick coating!). They’re sometimes difficult to handle though. Aluminium woks, on the other hand, get damaged quite quickly if they’re very thin. A cast-aluminium wok with a non-stick coating is a good alternative, or a cast-iron wok that's not too thick. >> Loop or stick handle? Some woks have just one stick handle, or a stick handle and a loop handle, or 2 loop handles. Get whatever you find easiest to use: loop handles are less practical for tossing food when cooking, but woks with loop handles can be brought over to the table and look good, create less washing up and keep your food hot! >> With or without non-stick coating? You’ll find a lot of woks with non-stick coating in the UK. This coating reduces the need for excessive amounts of oil and prevents food sticking. 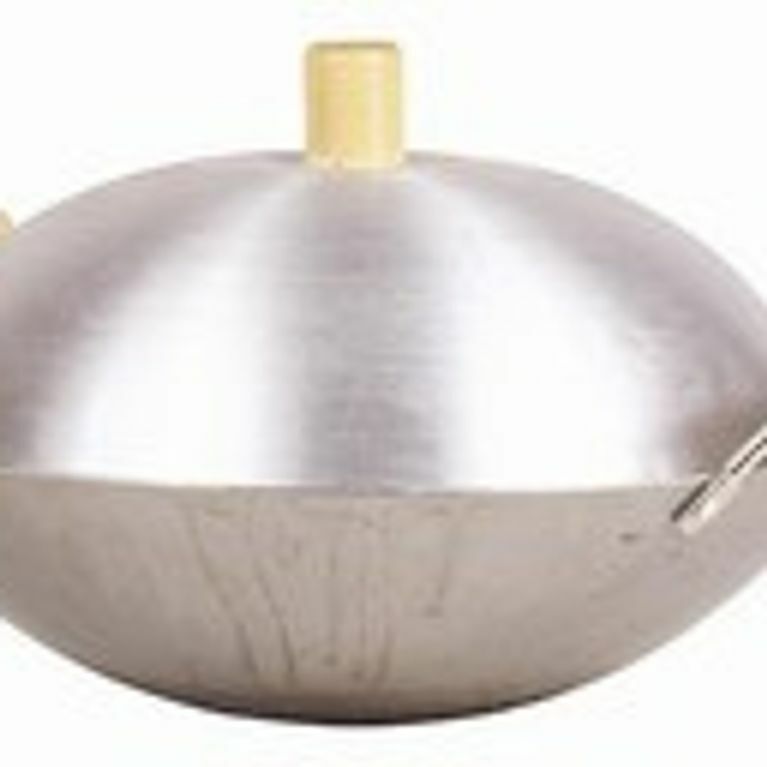 Traditional non-coated steel woks are better suited to pepole who are used to wok cooking. Wash your wok in hot water, without using too much washing-up liquid. Ideally, fill it with boiling water once you’ve served up, and leave it to soak. It will then just need a scrub with a sponge to get clean. If the non-stick coating gets damaged, oil it lightly using corn oil and kitchen roll. Cut all your ingredients into small, thin pieces of equal size. Sauté quickly over a fairly high heat, starting with the ingredients that take the longest to cook. Coat meat and fish with flour to stop it drying out. Dilute with thick chicken stock to get flavoured sauce. Flavour Chinese/Asian dishes with a bit of nuoc-mam sauce, and add 1 spoonful of oyster sauce to thicken at the end of cooking. Add herbs, spices and seasoning at the end of cooking. Stir frequently, bringing uncooked food into the centre and pushing cooked food to the edges. Cook diiferent ingredients separately, then reheat them all together to serve. Fancy trying some wok cuisine? If you need a few ideas, take a look at our wok recipes.